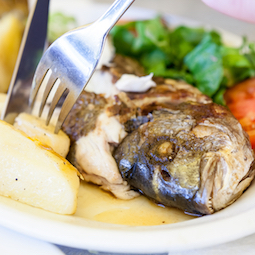 This whole baked sea bream is simplicity itself. The potatoes are par boiled prior to adding to the dish, you lay the fish on top and the juices flavor the potatoes. Serve with a simple green vegetable, such as spinach or broccoli or a salad. If you don’t know how to gut and scale the fish, then ask your fishmonger who will be pleased to do it for you – however, watch and learn so you can do it yourself if you have to! Parboil the potatoes for about 10 minutes, cool then slice into rounds. Take a large bowl and toss the potatoes, garlic, parsley, olives, oil and lemon juice. Season with pepper inside and out. Oil an ovenproof dish and spread the potato mixture on the bottom - lay the fish on top. 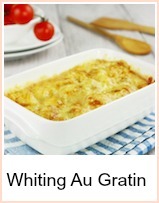 Pour the wine over and bake in the oven for about 30 minutes until the fish is cooked through. You can test for 'doneness' by pressing the fish with your finger - if it's firm, then it's ready. Serve hot with the juices poured over. 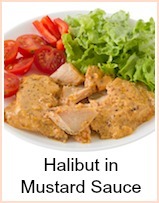 This is perfect for a quick meal for two - there is little work to do and it's a really simple fish meal. If you don’t like black olives – and many people don’t – a few chopped anchovies would add a great flavor to the potatoes - or don't bother with either. A very easy but special meal for two people. 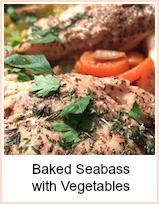 Of course, you can bake two sea bream if you want to. This would be great at a dinner party and is so simple to make - you do the preparation and then finish it off in the oven, leaving you free to do appetisers, desserts or have a glass of wine with your friends.